14 new highs and up 23.24% in the last month. 125.49% gain in the last year. 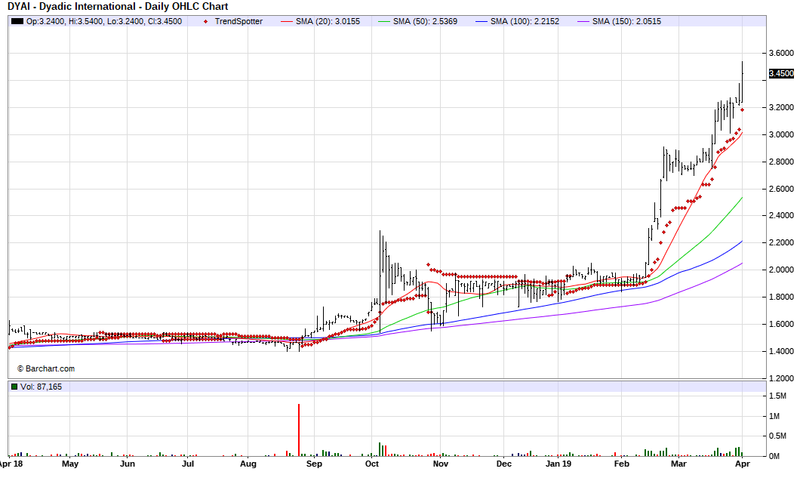 The Barchart Chart of the Day belongs to the genomics company Dyadic International (OTC:DYAI). I found the stock by using the Barchart screener to screen OTC stocks with Weighted Alphas of 34.00+ and technical buy signals of 80% or more. I then sorted by the highest technical buy signals and used the Flipchart function to review the chart for consistent price appreciation in the last year. Since the Trend Spotter signaled a buy on 1/9 the stock gained 75.13%.